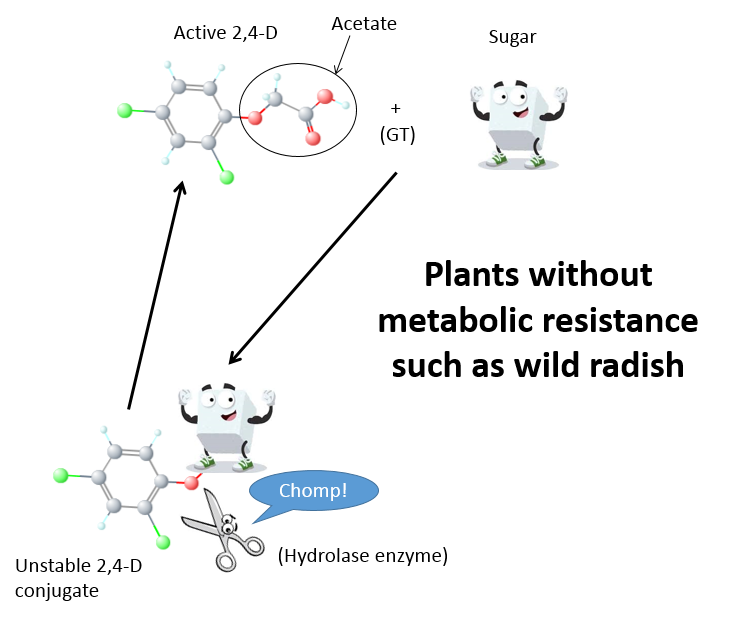 This is sort of what happens with 2,4-D in wild radish and explains why metabolic resistance is not the mechanism of wild radish resistance to 2,4-D. We now know this thanks to some painstaking research by AHRI researcher, Danica Goggin with funding from ARC and Nufarm. 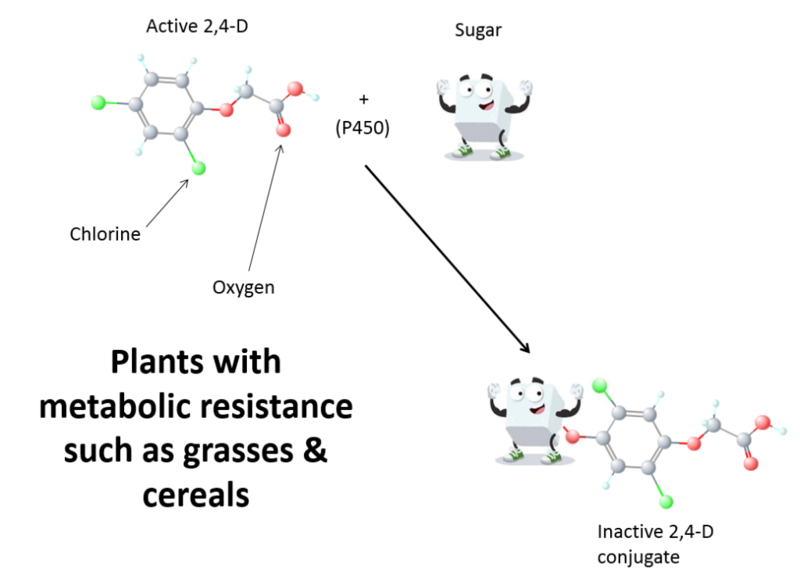 To demonstrate this, we have developed a cartoon to show you what is going on in plants that do and don’t have metabolic resistance. P450 is short for cytochrome P450 monooxygenase. In other words, they are enzymes that add an oxygen (in the form of hydroxyl) onto a molecule. In this case, as you can see in the diagram below when 2,4-D enters a grass plant, the P450 enzyme adds an oxygen to the carbon ring and then a different enzyme called a GT (glucosyl transferase) binds the sugar to this oxygen molecule. Now we have a great big molecule that doesn’t look or act much like 2,4-D anymore and it no longer works as a herbicide. In a previous edition of AHRI insight, we told the story of some of Danica’s early research where she found that reduced movement of 2,4-D between cells was the mechanism of 2,4-D resistance. But it is never that easy, there is just about always another mechanism. 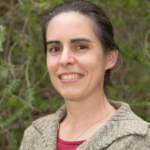 Danica then went on to test another 10 populations of 2,4-D resistant wild radish and found that four of them had reduced movement of 2,4-D and six had something else. The something else mechanism is the focus of more research by Danica and others. It looks to be something to do with auxin perception, and more research will confirm exactly what is going on.